I last posted a flamenco piece in September of 2007, not long after I started the blog. It’s probably true that when most people think of music from Spain, they might imagine a flamenco guitarist, singer, or dancer, despite the fact that technically flamenco is really the music of one region of Spain – Andalusia. However, it is true that flamenco has come to represent much more than the music of one region of Spain. Historically, there’s been quite a bit of argument about what is “true” flamenco and imitation flamenco. I’m certainly not prepared or educated enough to enter that debate, not being either an expert or from the region myself. But, I thought it might be time to return to the topic, and post an example of what some would consider genuine cante flamenco by two masters – Manuel Centeno, the cantaor (singer), and Niño Ricardo, the tocaor (guitarist). There are numerous song types in flamenco music, and those are known as the palos. The oldest and most intense songs are known as cante grande. These songs tend to best express the deepest, emotional sorrow or loneliness that is at the heart of real Andalusian flamenco. They are the Siguiriyas, usually a four-lined poem, and today’s piece, an example of the Soleá, also known as Soleares, which is usually only three or four lines as well. Scholars seem to disagree where the current form of Soleares developed, but Seville is often named as a possibility. The rhythm of the Soleares is always a 12-beat rhythm, with the emphasis on the 3,6, 8, 10, and 12 beats – but flamenco demands a fair amount of improvisation and interplay between the guitarist and singer, so the beat emphasis is really just a guideline. The guitarist usually plays in either the E phrygian or the A phrygian. The singer will inject his lyrics with dramatic melisma and the result, however familiar to fans of international music, can be undoubtedly powerful. There have been a number of reissues of early flamenco throughout the years, many of them with pretty dicey transfers. This track was at one point released on a Spanish CD, Volume 25 of Grandes Clásicos del Cante Flamenco. I’m not sure if that is in print any longer (it doesn’t appear to be), but the sound clips I’ve heard from the CD sound pretty crunchy, so I offer this instead. Thanks to Dax Diaz and Bill Dean-Myatt. Where to begin with flamenco? Despite it being the most well-known folk music of Spain, its origins seem to be constantly debated by experts. Unquestionably it is the music of the Gitanos (gypsies), Europe’s outcasts for centuries, who despite years of persecution, found a home in Andalusia. Over time, as persecuted Jews and Moors joined their communities, their ballads changed. Some maintain that flamenco singing most likely developed as a response to anguish, injustice, and oppression. Despite years of flamenco recording – with the earliest records being considered the closest to “true” flamenco – the music remains essentially a live experience; music and expression meant for an intimate juerga. However, some records by masterful players and singers certainly captured some of the power of a live flamenco experience, in my opinion. The cantaor and tocaor, the flamenco singer and guitarist, are only part of a larger equation. Equally as important in flamenco performance and the focus of today’s post is the bailaora (or bailaor, as the case may be), her dance, the clapping (palmas), and the castanets. The presence of castanets in flamenco is a hotly contested topic – for me, the best part of this 78 is the footwork. 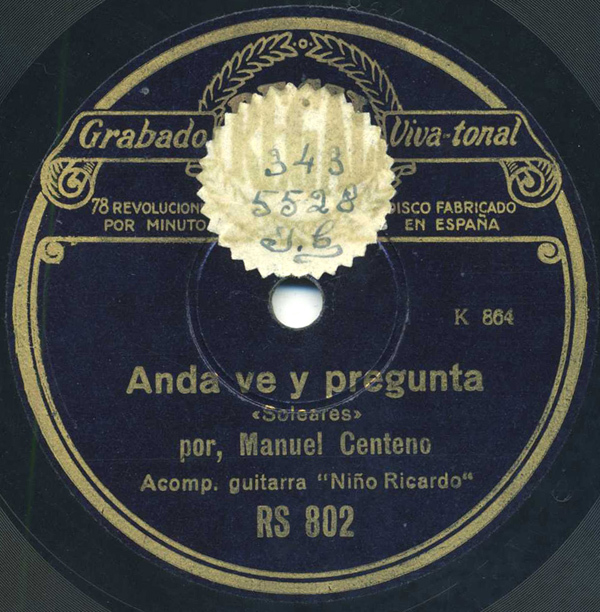 The vast majority of early flamenco 78s are simply guitar and voice. This was probably due to primitive recording technology – both the singer and guitarist had to stand right in front of a massive recording horn (or microphone). 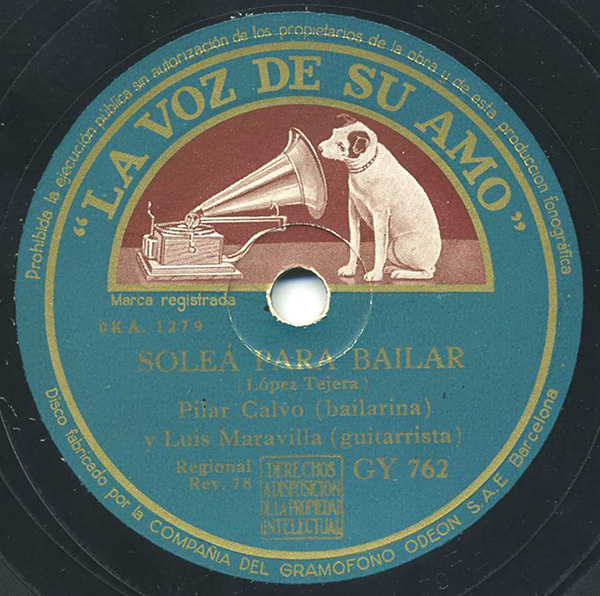 Flamenco 78s that just feature baile flamenco are particularly special, like this one, recorded in Barcelona in mid-1948 by Ms. Calvo and Mr. Maravilla. Despite the late date, the performances here are stellar – the interplay between Maravilla’s compás and Calvo’s feet is wonderful, and it builds to a thunderous, powerful crescendo. Just as powerful as any singer might achieve, I think (though I freely admit that I’m no expert, and some might consider this far from authentic). Perhaps this is because Calvo and Maravilla (born 1914) were husband and wife.